Excellent naturalizers. 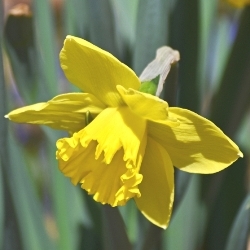 Trumpet Daffodils have the "traditional" daffodil form: there is one large blossom per stem and the trumpet is exceptionally long. Specifically: the length of the trumpet is equal to the length of the petals, or longer. These terrific naturalizers are noted for their long blooming season, and their very large blossoms. See also our Yellow Trumpet Daffodils by the Bushel for naturalizing large areas. Our selection of Trumpet Daffodils contains 20 each of Dutch Master, Holland Sensation and Mount Hood. Individually packaged and labeled. 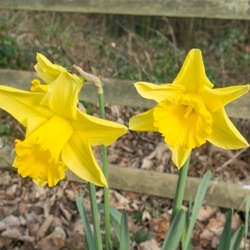 Counsellor is a ‘Large Trumpet’ daffodil that is all golden yellow. 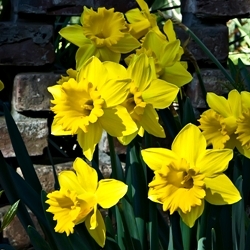 Dutch Master is the classic trumpet daffodil. It’s golden yellow with a long showy upfacing trumpet. 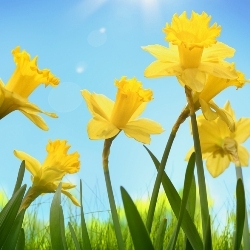 Flower Carpet is a vigorous trumpet Daffodil that lifts up and faces the sun. It has a light yellow perianth with a slightly darker trumpet. 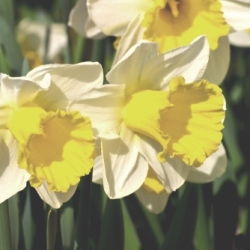 Holland Sensation is a ‘Large Trumpet’ daffodil that is a very strong white with a large yellow trumpet. 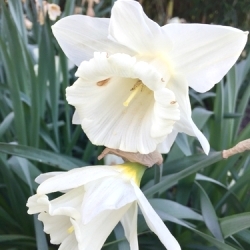 Mount Hood is a ‘Large Trumpet’ daffodil that opens with a flushed pale yellow trumpet that fades to pure white. Rijnveld's Early Sensation is the earliest of the Large Trumpet daffodils. Its petals are yellow with a darker yellow 3” trumpet. There can be several flowers per bulb. Unsurpassable is a large golden yellow trumpet daffodil with a giant ruffled trumpet.